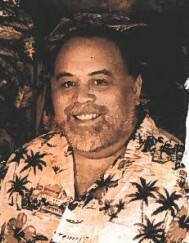 WAYNE MICHAEL PACHECO, 62 of Pearl City, passed away on March 25, 2019 in Honolulu. He was born in Honolulu, Hawaii. He is survived by his spouse Raquel Pacheco; son Tyler Pacheco; sister Wanda Pacheco. Visitation will be 5:00 pm Friday May 3, 2019 at Mililani Memorial Park & Mortuary's Makai Chapel. Memorial service to follow at 6:00 pm. Burial will be 3:00 pm Tuesday May 7, 2019 at National Memorial Cemetery of the Pacific. There's still time to send flowers to the Visitation at the Mililani Memorial Park & Mortuary - Makai Chapel at 5:00 PM on May 3, 2019.